Many times our customers come across situations where the only power supply available is in a form other than the standard 120VAC. Or in some cases it may make sense to use the voltage available instead of converting to 120VAC just to use an isolation relay. Fortunately, Solid State Instruments provides a few power supply alternatives for the majority of our relays, eliminating the need for an inverter, power transformer, or a more expensive power supply configuration. The DCS-1 is a 125VDC auxiliary power supply. This option is typically used in applications where the relay must run on Station Power (the industry standard for substation battery banks is 125VDC). By using a DCS-1, the need for an inverter is eliminated. The output voltage of 12VDC, also supplies power to the relay in addition to supplying the wetting voltage to the meter. Due to its small size, it can easily replace the power transformer on the SSI host relay without requiring additional wiring or mounting space. When ordering, simply add a -SP2* on the end of a standard SSI relay part number, and the relay will arrive ready for immediate use and equipped with a factory installed DCS-1 power supply. The DCS-2 is a Class 2 (low voltage) 15-48VDC auxiliary power supply. This option is frequently used by value-added resellers or systems integrators who attach a SSI relay to other pieces of equipment, many times a metering or control panel. The goal is to keep conductors separate in order to avoid noise coupling caused by the intermingling of voltages. (In other words, limiting the number of wires that run across a control panel to reduce the occurrence of mixed voltages.) So instead of powering the relay from an external supply source (running wire), a simpler solution is to have the relay receive power directly from the control panel’s DC source. This usually requires a lower voltage, and the DCS-2 is a convenient, cost-effective solution that will do just that, and just like the DCS-1, won’t increase the “footprint” of the relay. When ordering a relay with the DCS-2 power supply option, just add a –SP13* on the end of the standard SSI part number, and the relay will arrive with a factory installed low voltage power supply. The MPS-1 is a low-cost linear power supply transformer and regulator, made just for providing a wetting voltage in metering applications where it is unavailable. The MPS-1 is installed between the meter and the receiving equipment. It converts the standard input voltage of 120 VAC to a variety of possible VDC output options. 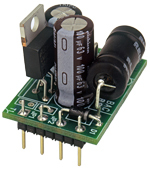 Standard output options include 12VDC, 15VDC and 24VDC. 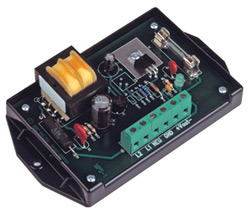 Other specialized voltage options are available from a range of 3VDC to 24VDC. Merely specify the output voltage needed by adding it to the end of the MPS-1* power supply. The MPS-1 also includes MOV transient suppression on both the input and output voltages, and its output is internally current-limited, which helps to prevent damage in the event a short circuit condition occurs. If you're in need of an alternative power supply, contact the experts at Solid State Instruments... We may have just what you're looking for! Previous Article:Part 2: Additional Outputs Needed?